There’s something refreshing about minimalist spaces. Perhaps it’s having only the things you need, the stark yet cozy color palette, or the feeling that your home can breathe. When we visited this unit in Quezon City, we can’t help but fall in love with its bright and airy vibe. 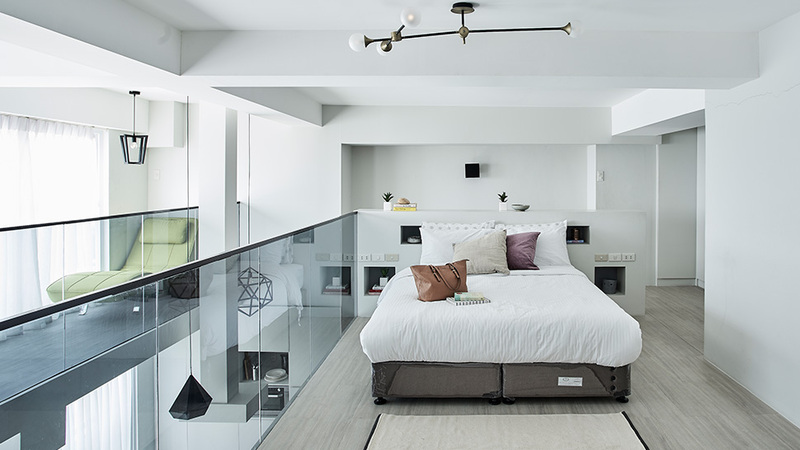 Managed by StayHome Asia for short-term rentals, it used to be a plain 45sqm unit renovated into a 70sqm loft. “Since the location is far from the known CBDs like Makati and BGC, we advised the owner to invest in a renovation. We suggested a modern, minimalist design with a Scandinavian look, feel, colors, and materials,” shares Diana de Castro of StayHome Asia. The unit underwent a 360-degree transformation with the help of an Italian designer from Enzyme APD, a design agency based in Hong Kong. Aside from the floor-to-ceiling shelf and calming colors, the design team was also able to incorporate an indoor balcony, two bedrooms, and a mini glass walkway.